as my brain is remembering some recent discussions in one of the fashion groups I belong to in Facebook. It appears that so many of us women are falling into this 'perpetual cycle' of trying to 'find ourselves' or desperately seeking to have some 'experts' tell us who we are or what suits us, or how we should be dressing ourselves. There are different levels of engagement which I believe IS an important need that we, 'hormonal' female species must tend to... I'm not arguing over the Need part... but rather, questioning the direction of our focus. 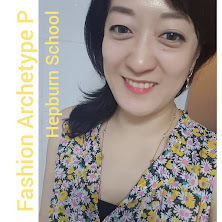 I've just spent a couple of minutes, or actually this has been an on-going search lately, wondering if the astrology based fashion systems could help me figure out what it is that would help me express my so-called 'authentic' self. And I just realized, given my very NT-brain (MBTI jargon!) was falling into its usual habit of going into my Thinking mode... my Analytical mode... when I know that I'm just one of those people that often finds Answers through INTUITION. I mean, it's just one of those things... How would you know what fashion system is the one that'll get you to the mysterious X-mark taunting you in your head? but I'm just one of those people that even if someone TOLD ME what I was, I wouldn't abandon my current practice, because on *some* level, I feel I DO know what I like best, and based on experience, I DO KNOW what works best. b) would NEVER dream of doing anything over-the-top for my work wardrobe. This is pretty much the 'gist' of my Fashion-Identity-Affliction~!!! ... FOR AS LONG AS I CAN REMEMBER. So now, the more 'existential' part of me ponders, Hmmm, so... is the part of me succumbing to the notion of 'Respectability' which is deeply ingrained and instilled in me, the reason why I'm getting nowhere with my Dream Personal Style? Despite the discomfort I put up with, even when I felt really good about the midnight-blue work shirt and Japonesque subdued Indian pink pencil skirt, with the tan double strap leather belt, NOBODY even noticed it or mentioned what a lovely outfit it was, or how stylish I looked. I mean, when I saw myself that day, I felt pretty creative about it... You know? and more of a lifestyle change goal? Of course, there is usually a correlation between your Inner and your Outer self... but it seems important to figure out what Intention you're really trying to set sometimes. Thanks for reading all this! !